J.G. Quintel is the creator of Regular Show and the voice of one of its main characters, Mordecai. Cartoon Network's Regular Show follows the misadventures of a blue jay named Mordecai and a raccoon named Rigby. In its fifth season, Cartoon Network's Regular Show has gained fans of all ages. Each 11-minute episode of the Emmy-winning series starts with pencils and Post-it notes. The Cartoon Network office in Burbank, Calif., is bustling with activity. Conference rooms are full of writers pitching new episodes, artists are busy sketching storyboards. On the Regular Show's floor, J.G. Quintel is playing a game of table hockey in the hall. He's the creator of the cartoon, which is based around a blue jay named Mordecai — that he voices — and a raccoon named Rigby. "It's all about their adventures and working a minimum-wage job at a park," Quintel says. Every episode starts off pretty normal. Their boss assigns them duties and Mordecai and Rigby reluctantly go off to work. Eventually, they get bored and get into mischief. That's when things get out of hand, from time travel to unleashing a monster out of an arcade game. While the show's target demographic is kids, this isn't exactly a kid's show. According to Nielson Media Research, more than a quarter of the show's 2.6 million viewers are over the age of 18. "Kids sometimes will walk in on their parents watching it without them and we hear about that on the Internet all the time," Quintel says. "That's exactly what we want." 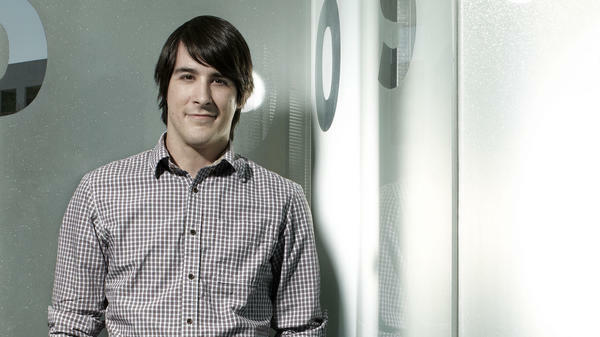 Each episode is just 11 minutes long, but it's no small operation, Quintel says. "It's very much an assembly line," he says. "Writers, storyboard artists, painters, character designers, prop designers." They have about 40 members on their team. And it all starts with a pitch. The best ideas in the writers' meetings get sketched onto Post-it notes that cover the walls of their conference room. The story is refined and drawn into big booklets called boards. Quintel pulls one from his desk. It's like a thick comic book. From Burbank, all of the materials get sent to Seoul, South Korea, where it finally gets animated. Outsourcing is common with American cartoons. Shows like The Simpsons, Family Guy and SpongeBob SquarePants have been doing it for years as a way to save on studio costs. As for Regular Show, a single episode takes up to nine months to produce. The team usually has 20 episodes in production at once. "To see at the end of it, all that work that goes into it," says Quintel. "And then for it to play for 11 minutes and be over. People are just like, 'Next one please!' And you're like, 'That was really hard to make.' "
But Quintel promises there are plenty more adventures in store for Mordecai and Rigby. Cartoon Network's "Regular Show" is one bizarre adventure after another. It's about a blue jay and a raccoon who do crazy stuff. They travel through time, summon the god of basketball and, in one episode, teleport to the moon. For the creators of "Regular Show," actually making this cartoon is its own adventure. NPR's Daniel Hajek takes us behind the scenes. DANIEL HAJEK, BYLINE: Walk through the doors of Cartoon Network Studios in Burbank, California, into an office bustling with activity. Conference rooms are full of writers pitching new episodes. Artists are busy sketching storyboards. And in the hall, J.G. Quintel is playing a game of table hockey. J.G. QUINTEL: So this is the "Regular Show" floor. This is where we make "Regular Show." There's about 40 of us, all different jobs, to kind of put together the show. QUINTEL: (As Mordecai) Dude, we're 23 years old. We shouldn't be busting holes in walls. We're going to get fired for this. HAJEK: ...and a raccoon named Rigby. WILLIAM SALYERS: (As Rigby) You mean you're going to get fired for this. It's all about their adventures and working a minimum wage job at a park. HAJEK: In this scene, their boss, Benson, who is a gumball machine, is assigning jobs to his park staff. SAM MARIN: (As Benson) Mordecai and Rigby, you set up the chairs. QUINTEL: (As Mordecai) Dude, how come we always get stuck with the lame jobs? Setting up the chairs? MARIN: (As Benson) I can't trust you guys with something actually important. You're always slacking off. QUINTEL: (As Mordecai) Look, dude. We can totally set up all those chairs without slacking off. MARIN: (As Benson) Do it then. HAJEK: Every episode starts off normal enough, but eventually things get out of hand. Instead of setting up the chairs, Mordecai and Rigby find a broken down arcade game in an abandon shed. QUINTEL: (As Mordecai) In the name of all that is holy, don't connect the red wire to the blue wire? SALYERS: (As Rigby) In the name of all that is holy, don't connect the red wire to the blue wire? HAJEK: Rigby tosses the note aside and, of course, they connect the wires unleashing a monster that terrorizes the park. 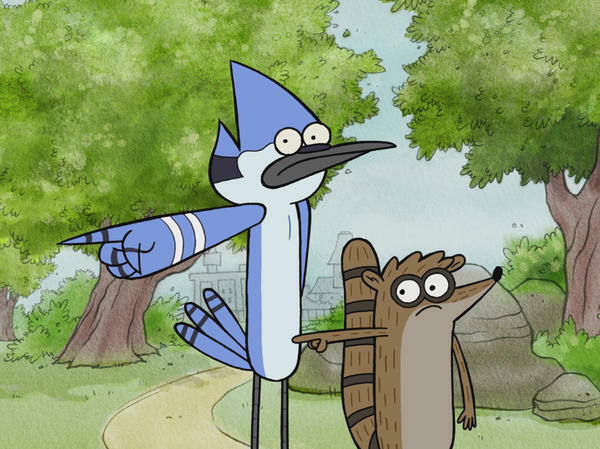 QUINTEL: (As Mordecai) Dude, what just happened? SALYERS: (As Rigby) I don't know. HAJEK: While "Regular Show's" target demographic is kids, this isn't exactly a kids' show. According to Nielsen Media Research, over a quarter of the show's 2.6 million viewers are over the age of 18. QUINTEL: Kids sometimes will walk in on their parents watching it without them. And we hear about that on the Internet all the time, and we're like, yeah, that's exactly what we wanted. HAJEK: "Regular Show" is in the middle of its fifth season and last year won an Emmy for Outstanding Short Format Animated Program. Each episode is just 11 minutes long, meaning two episodes air in its half-hour time slot on Cartoon Network. Quintel says it's no small operation. QUINTEL: It's very much an assembly line, you know, writers, storyboard artists. We have folly guys who are doing the sound, painters, character designers, prop designers. HAJEK: And it all starts with a pitch. The best ideas in the writers' meetings get sketched onto Post-it notes that cover the walls of their conference room. The story is refined, then drawn into big booklets called boards. Quintel pulls one from his desk. It's like a thick comic book. QUINTEL: One episode is like 250 pages with two drawings on a page and all the writing is there. HAJEK: Those boards go to stylist Jessica Yost. She uses Photoshop to bring color into the stills. JESSICA YOST: Like, I'll put a background in, and if there's a couple characters in there, I'll throw them in there so you can kind of get an idea of what that looks like. QUINTEL: She colors every little thing, like, if it's a pencil or a bag of chips or the main character. QUINTEL: We love explosions on the show. YOST: Lots of them, yes. QUINTEL: Epic explosions. The more epic, the better. I love them. QUINTEL: (As Mordecai) I've got an idea. HAJEK: Meanwhile, animation director Robert Alvarez is in his office penciling in instructions onto what's called an exposure sheet, a long, lined document that provides detailed guidelines for the animators. ROBERT ALVAREZ: It's just their blueprint. So it's like you're telling them everything you want and hopefully you get it back that way. HAJEK: Every movement of each character in every frame is accounted for. Alvarez logs nearly 16,000 frames per episode by hand. ALVAREZ: I had a bar room brawl where all the characters are fighting. And you see this long, you know, wide shot of everything that's in it. And you go, OK, they're not all doing the same thing. So you have to break it down. Like, one guy's throwing a punch with his left, another one's pointing right. And you have to break all that action down and squeeze it in on to the exposure sheets and make sure it makes sense. MARIN: (As Benson) This is a decent family establishment. Don't need you, lowlifes, messing things up. HAJEK: From Burbank, all the materials get sent to Seoul, South Korea, where it finally gets animated. Outsourcing is common with American cartoons. Shows have been doing it for years: "The Simpsons," "Family Guy," "Futurama," even "SpongeBob Square Pants." It's a way to save on studio costs. From start to finish, a single episode on "Regular Show" takes nine months to produce. The team usually has 20 episodes in production at once. QUINTEL: For it to play for 11 minutes and be over, people are just, like, next one, please. And you're like, that was really hard to make. HAJEK: But Quintel promises there are plenty more adventures in store for Mordecai and Rigby. HAJEK: Just don't let the name fool you. HAJEK: There's nothing regular about this show. Daniel Hajek, NPR News. Transcript provided by NPR, Copyright NPR.